Joining us is the author of the resource, consultant Michelle Anderson-Draper who will walk us through the highlights of this resource and how it can help you and your agency. Also joining us to provide a front lin perspective will be Jennie Carrier, the Youth In Care Mentoring Coordinator for Big Brothers Big Sisters of Calgary and Area. Please circulate this invitation to learn more and receive an advance copy of the resource. The role that significant adults can play in the lives of children and youth in government care is at the forefront of trauma-informed practice. The act of building healthy, enduring, long-term relationships and experiences between adults and young people is the essence of practice in youth mentoring. Using trauma-informed practice and research-based practice from mentoring programs, three project sites in Alberta (Edmonton, Red Deer and Calgary) have developed and implemented significant approaches to effectively engage, connect and support children and youth in care with adult mentors. 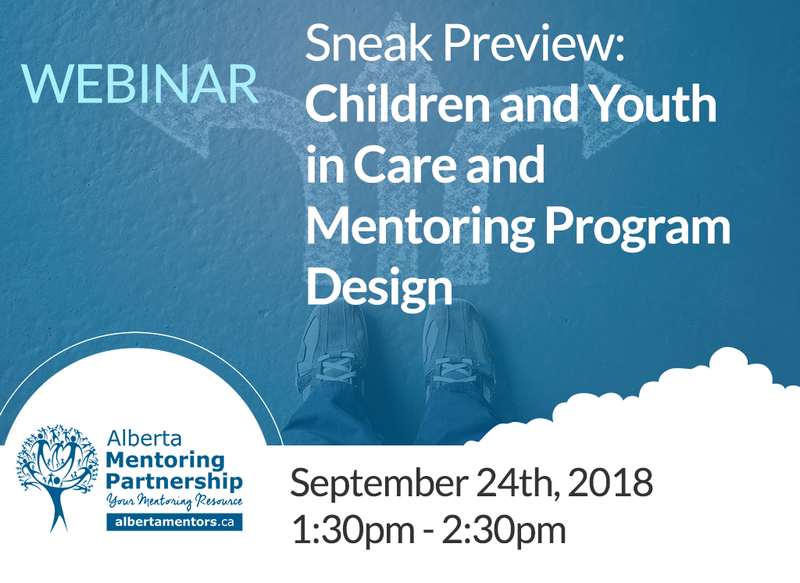 The Children and Youth in Care and Mentoring Program Design outlines these practices and highlights essential elements when establishing and implementing mentoring programs for children and youth in care.